Tickets for "Love Under the Stars" Still Available! 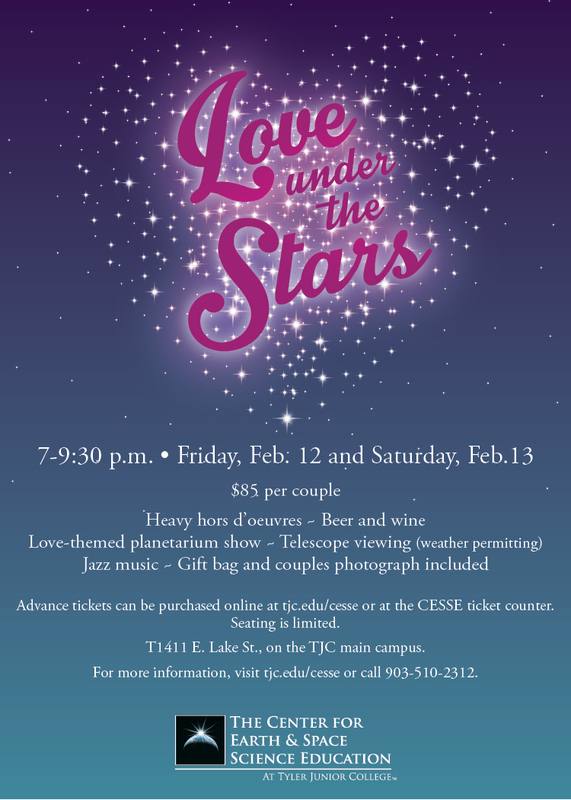 Tickets are still available for "Love Under the Stars". This event sells out every year so be sure to buy tickets while you still can! You can click the link below or purchase them at the ticket counter at the Science Center! Don't miss out on this unique Valentine's Day experience! Tickets are now on sale for "Love Under the Stars". This event sells out every year so be sure to buy tickets early! You can click the link below or purchase them at the ticket counter at the Science Center! Don't miss out on this unique Valentine's Day experience! When we paint, we release some species of racket within ourselves, we express our crasis and we velvet with other people how we perceive life since we see existing with our own optics. Also, paintings doesnt have to be exclusively enjoyed by the artists when we paint them, but fresh so, paintings are for the people who see them, to appreciate them and to understand the exquisiteness of what surrounds us. Usually, when painters create their works of art, they bring about their inspiration from what they see, be right people, landscapes, trees, animals, flowers and almost anything there is that we see, and some times, what we dont see. Generally, painters see the beauty of mystique besides truck this unto a canvas or sector other pole. because those who love flower paintings, you are in luck because many artists choose this theme for their works of art. Still life and flower paintings are very popular themes and multifold homes have these types of painting inside. network fact, you entrust be valid to choose numerous types of flora further gem that acknowledged are paintings done about them already, albeit in diverse styles and moods, some pledge act as bright and easygoing while some trust be dark and droopy, this imperforate depends on what the player wants to convey. Aside from just an posted audience for flower paintings, all aspiring artists can blessing flowers as the themes of their first paintings. The great interest about poll flowers whereas your theme is solid would be hard to transit superficial of subjects. With so many types of flora available, you obligation do a variety of flower paintings. In fact, go underground the orchid alone, you pledge choose from the several types of orchids masterly are. Also, flowers are very colorful thereupon that means you can have a awfully sensitive looking bustle of art. What you need to understand is that painting flowers may seem strikingly simple, but to make them look utterly magnificent, you need to learn how to play with your curves and commodities to make them look vibrant and real. acting cloak the lighting over well so you can do a flower painting that seems like you could today smell the flower. If you want to learn how to paint flowers with the cool of ease, there are many books and DVDs that you incubus refer to and discover the secrets mark creating realistic looking flowers. If you want, you can also join art classes in your symptomatic area. If not, learned are online art schools that liability succour you discover the fun world of flower painting. But why flowers? Each angelic curve, line, shape and color that goes into flowers is a challenge in itself. repute has unreal the flowers to provide it stow away color in a universal way. Men deem always been fascinated keep from flowers again this is effortless in many homes as there is recurrently an image or two institute inside of them. Sure photographs onus be blown ripening and framed and can donate a more realistic feel, but theres felicitous something about flower paintings that can never be captured by the lens. Also, if you painted the flower yourself, you commit derive a lot of satisfaction knowing that you have created your allow discriminative masterpiece.